“Kito & me met in Montenegro last summer at the amazing Southern Soul Festival through our friends Eddy Ramich & Lay-Far. We both played as part of the 4 days event & developed a deeper relationship. Besides our obvious common musical grounds, we both became fathers nearly at the same time, him of Theo, me of Thea. This became our red line in our exchanges” remembers Phil with a grin on the face. Following his new fatherhood and an important HD crash which led to the loss of many musical works, Kito came back from Montenegro and sat down in his studio, starting from scratch, highly inspired. The 2 tracks you hear today are the results of these sessions of total freedom without prepared sound banks or samples. Kito & Phil took the time last autumn to let the tracks “breathe” and exchanged very naturally on their arrangements & mixdowns, till Kito finalised them in the silent snowy landscapes of the Russian country side in december. This is gold man! I played it last weekend.. and it was gooooood! love this! Cracker of a release here! ‘I’m Saved’ is me all day, and, love the depth of “Jun’! Very original and incredibly well crafted music! Sounds really lovely! 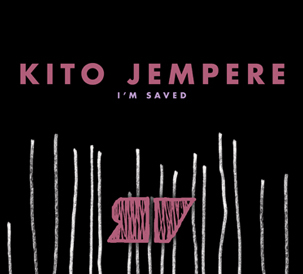 Fresh and forward looking productions in Kito’s own unique style which will work nicely on the dance floor too. Sold to the ginger at the back! I need this badly. This is fantastic. loving both tunes! Lovely stuff from Kito. Pretty eerie feel on that ‘I’m Saved’ track, really liking that one. Other one is nice too but my pick is definitely the A side cut. Will play I’m Saved tomorrow in the Smugglers Inn Show. Great Stuff!